It can be one of two worlds: inner subjectivity or what our senses bring out for us. Although it is very difficult to establish a "normal" perception condition, probably the best shot is that your are "normal" when no thought takes care of your subjectivity, when you might otherwise, as Freud defines thinking, that either it is figuring out on what or how to do something, or would be in a "problem" state. In a paradoxical way you have to be "empty" to have a better sense about what the outside world is feeding your senses, or rather, when our "conscience" favors these sensations, because, there is no way to be empty unless you loose conscience. The equivalent perception to inner subjectivity is an area ob enormous contention by philosophy, psychology, etc., but in our case, I prefer to limit it to a subject's personal perspective, feelings, beliefs, desires or discovery, as opposed to those made from an independent, objective, point of view.The inner basic sense I think it is space and time, and it's hard to think of something without categorizing these values and, as matter of fact to me, The Critic of Pure Reason by Kant boils down to that. Vision lies in the eye. 6. Carrier Idiosyncrasy, not in the quirk sense, but in our uniqueness and singularity. This picture (by Erhard Jacoby) illustrates the fact that each one of us, knowing the world through our individual psyche, know it slightly differently from each other. 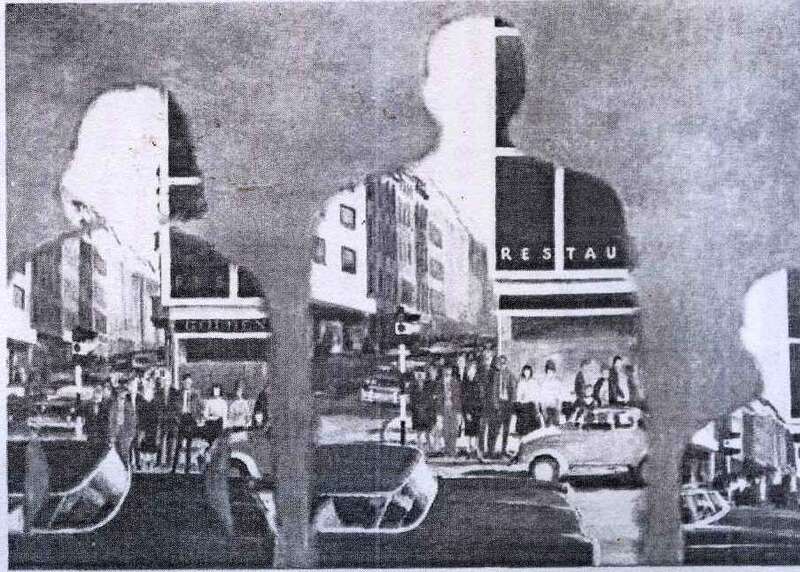 The man, the woman and the child above are looking at the same scene, but for each one different details appear more or less lighter or darker. Only through our conscious perception is that the world "out there" exists: we are surrounded by something completely unknown and impenetrable (represented by the gray background, on second plane in the picture). What is at stake here is that there is not a fixed point of view, but rather an evolving mobile standpoint. The whole modernist aesthetic revolves around this. The contribution, better yet, revolution James Joyce brought, if analysed or appreciated through words, produces such an amount of essays, discussions, references, which is caused from the limitations of the printed word way of approaching it and is one of the basic areas exposed in this whole job. It is consequence of the technology put together by Johannes Gutenberg and the privilege granted to it as "the" method of expressing things.A quintessential demonstration of this is the collection of essys or reviews about Finnegans Wake, OUR EXAGMINATION ROUND HIS FACTIFICATION FOR INCAMINATION OF WORK IN PROGRESS. What Gutenberg invention made possible is called Print visual Culture, which although not replacing, took over the till then prevailing Acoustic Culture. The difference between printed Visual culture point of view (which became"standard") and the Acoustic culture point of view can be better understood orperceived in this article. To figure out the revolution and contribution James Joyce brought to the Print Visual Culture, is a lot easier if you compare it to the same revolution happened in painting. Another example is a combination between image, printed and Internet information at Famous People trough painting. Another good example if not the best is The School of Athens by Raphael. An Encyclopedia at your finger tips! Basically this whole job is an attempt to create an Encyclopedia on James Joyce and his works and explore it the same way. What is involved here is a much wider subject and does note receive from the Ivory Tower self proclaimed "owners" its due attention. To a point that they do not even recognise the best theoretician on the subject which is Marshall McLuhan. I used extensively McLuhan on Ulysses and in the Projects portion of this jobs it becomes apparent his contribution on elucidation and appreciation of James Joyce, besides, obviously, what he was all about, i.e., a more detailed explanation about McLuhan, Print Visual Culture, Acoustic Culture and LiIterature , etc. To make an extremely long story short, the best way is to go through The case of the Africans, which McLuhan used in his Masters Thesis. Although this fact exists and is appointed, there is little intellectual exploration of him and on the Internet only find this kind of interest on the part of people involved with aspects of communication, especially in the graphic arts, such as the expansion that added to the account of McLuhan in case of Africans. The shape as an oral or alphabetic culture settles in the brain is unknown, or not recognized as valid scientific concept, however, no doubt that mental posture changes under the influence of a means of better communication or radical, in relation to usual "until then", and this is one of the largest McLuhan's insights. Ezra Pound and Wyndham Lewis tried to wake his contemporaries with insighits about it and failed. McLuhan knew it and did not want to suffer the same fate, however, indicate the specific dimensions of change, given its complexity and subtlety, is an extremely difficult thing. Where would, as there are other explanations, allocating other causes. He teamed up with Robert Logan, who had a theory about the hemispheres of the brain. The theory was that the two sides of the brain control different mental and physical functions. He was so excited that put a diagram of the brain divided into two wall co center where she worked. For McLuhan, the right brain, in its interpretation and hypothesis, was the seat of acoustic things, simultaneous, intuitive, that is, the hemisphere of the electronic age. The other hemisphere, was connected with the visual, linear and quantitative, that is, from the phonetic alphabet and impressions. The famous "dissociation of sensibility" that Eliot cometara in relation to the poetry of Dryden in the 17th century, it would be this division of the brain. O que está em jogo aqui é que não existe um ponto de vista fixo, ma sim, um ponto de vista movel que evolui. Toda a estética modernista gira em torno disto. Embora este fato exista e seja apontado, existe pouca exploração intelectual dêle e na Internet apenas encontramos este tipo de interesse da parte de pessoas envolvidas com os aspectos da comunicação, especialmente nas artes gráficas, como é o caso da expansão que acrescentei ao relato de McLuhan para o caso dos africanos. Note bem, as imagens e explicações para audição e visão, são as utilizadas pela oftalmologia e pela otorrinolaringologia e os centros cerebrais são aqueles mesmos, que sob cirurgia (lobotomia), apresentam sequelas que significam perda ou alteração da função. A forma como uma cultura oral ou alfabética se instala no cérebro, é desconhecida, ou não reconhecida como noção científica válida, porem, não há duvida que a postura mental se altera sob influencia de um meio de comunicação maior, ou radical, em relação ao usual "até então", e este é um dos maiores insights de McLuhan. Ezra Pound e Wyndham Lewis tentaram acordar seus contemporâneos com insighits sobre isto e falharam. McLuhan sabia disto e não queria ter a mesma sorte, porém, indicar as dimensões especificas da mudança, tendo em vista sua sutileza e complexidade, é uma coisa extremamente dificil. Sempre haveriam, como existem outras explicações, alocando outras causas. Ele associou-se com Robert Logan, que tinha uma teoria sobre os hemisférios do cérebro. A teoria era que os dois lados do cérebro controlam diferente funções mentais e físicas. Ele ficou tão entusiasmado que colocou um diagrama do cérebro dividido em dois na parede co centro onde trabalhava. Para McLuhan, o lado direito do cérebro, dentro de sua interpretação e hipótese, era a sede das coisas acústicas, simultâneas, intuitivas, ou seja, o hemisfério da era eletrônica. O outro hemisfério, estava ligado com o visual, o linear e o quantitativo, ou seja, do alfabeto fonético e das impressões. A famosa "dissociação de sensiblidade" que Eliot cometara em relação à poesia de Dryden no século 17, seria esta divisão do cérebro.